New Delhi, Mar 01, 2017 : The price of non-subsidised cooking gas (LPG) was hiked by a steep Rs. 86 per cylinder on Wednesday, reflecting international trends. Non-subsidised LPG, bought by those who have either given up their subsidies or exhausted the quota of 12 bottles of 14.2-kg in a year at below market price, will now cost Rs. 737.50. It was priced at Rs. 651.50 per 14.2-kg cylinder till yesterday, according to state-owned oil companies. The hike, steepest in the history, comes on back of Rs. 66.5 per cylinder increase effected from February 1. Rates have been on the upswing since October, 2016. A non-subsidised LPG cylinder was priced at Rs. 466.50 in Delhi in September and has risen by Rs. 271 per bottle or 58 per cent in six instalments. 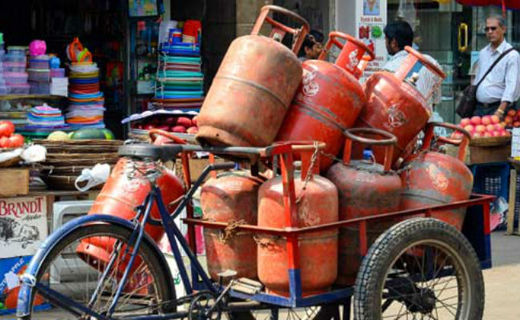 Oil firms also raised price of subsidised cooking gas by a marginal 13 paisa to Rs. 434.93 per 14.2-kg cylinder. This follows a 9 paise increase effected from February 1. Prior to these two marginal price hikes, subsidised cooking gas rates had gone up eight times of nearly Rs. 2 per cylinder each. Aviation turbine fuel (ATF) price was also raised by a marginal Rs. 214 per kilolitre to Rs. 54,293.38 per kl. The increase comes on back of a 3 per cent hike on February 1. Giving an illustration, it said the consumer will pay Rs. 737 for a new refill in Delhi and will receive subsidy amount of Rs. 303 in his/her account and the net price for the consumer will be Rs. 434, which remains unchanged. Are the rates for cylinder standardized ?